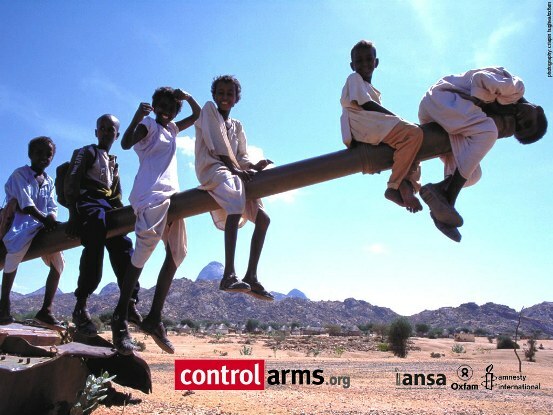 Scottish arms control campaigner, David Grimason, will be joined by politicians, campaigning organisations and activists at Glasgow University on Monday 13 February, to launch Amnesty Scotland’s campaign for a global Arms Trade Treaty. David Grimason, who has pushed for tighter controls on the arms trade since his two year old son Alistair was shot and killed in a Turkish cafe in July 2003, will speak about his experiences and involvement in nearly ten years of arms control campaigning. “It is incredible to think that we may finally be on the brink of delivering something that will prevent the devastating impact that the arms trade has on families around the world. After nearly a decade of governments saying that something must be done, now is the time to finally do it. “It is up to our politicians to ensure that they put people’s lives ahead of profit, but it is also up to the people of Scotland to make their voices heard and demand that the UK is at the forefront of championing a comprehensive treaty on the sales and transfer of weapons. ” It is mind-boggling to think that we have international treaties governing the selling of postage stamps, bananas, and even dinosaur bones. But when it comes to weapons and the impact that an irresponsible arms trade has on the lives of hundreds of thousands of people around the world, there are no controls. Monday 13th February marks the first day of a week-long conference where countries will debate how the final negotiating conference will operate, as well as some of the content of the treaty including aims and objectives, scope and reporting mechanisms. The final scheduled Treaty negotiating conference will be held at the UN Headquarters in New York from the 2nd until the 27th July this year. Amnesty International will be joined by Oxfam Scotland, Scottish Refugee Council and the Glasgow Human Rights Network. The event will include a panel discussion followed by a Q&A. Amnesty International will also launch its Scottish campaign briefing at the event.